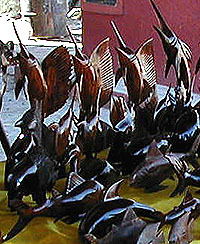 Shopping in La Paz should bring you bargains on arts and crafts that other more popular resorts sell at higher prices. You will also find art galleries. Most shopping for the tourist is along the malecon or within a few blocks of it. Mercado Madero or the central market is located at Revolucion and Degollado. Here you'll find crafts, household goods and small food stalls. La Paz has all the shopping necessities of a capital city and you will be able to find pharmacies, grocery stores, furniture and household goods, and much more.